Forum Home - > Pow Wow Arena > Men's Dance Styles > Grass Dancing I would like to Grass Dance. I would like to Grass Dance. Last edited by Yeiltleix; 08-30-2017 at 01:12 PM..
Hi there and welcome to Powwows.com. I'm one of the forum admins and also a grass dancer. First question I have is - since I am an admin I can read edited posts and am wondering why you decided to edit out the content of your original post? The content seemed relevant. As far as your question regarding tips. My suggestion is that you watch lots and lots of videos and pay attention to the footwork. Other than doing some online homework the best way to learn it is to find someone who knows the dance and ask them to teach it to you. You will also need to learn the songs commonly used for grass dance such as the straight, crow hop (my favorite), double beat, and the occasional chicken dance song. Most powwows will give the dancers 2 songs back-to-back. The first song is usually a straight song and the second song could be any of the others I listed or it could be another straight song. As with all dance styles just watch out for the trick song, where the drum will just stop and then pick back up in an effort to see which dancers are paying attention as well as to make them overstep. It takes some practice. Also it uses your leg muscles in ways that you may have never used them before so be prepared to do lots of conditioning to train for stamina. This past weekend I was one of 14 dancers in adult mens grass so they gave us 3 straight songs, needless to say my calves are killing me and I'm only 31! Thank You for your response. I am not sure why I decided to drop my original question, to be honest. My gut told me that is a lot to ask for right out the gate. I been known to be wrong about some things though. Although, since you have mentioned this deleted question. Would you happen to know the position of the founding tribe or tribes of grass dancing, in regards to this dance inter-tribal adaption in powwows? Thank you for your helpful tips on how to learn grass dancing. I am going to actively seek someone out to teach me whom has been doing it for awhile. I will also follow up your tips and get myself started. The grass dance started with the Omaha tribe, which I am not a member of and thus can't speak on their thoughts on it per say but I'm guessing that it's a non-issue with them since just about every tribe has a grass dancer these days. Yeah, true, I thought of another question last night regarding regalia. Does the cape and the apron have a particular shape in which is required? Also, could the material be any type or is their a typical rule or possibly some kind of unwritten rule regarding material? I would like to incorporate my own tribal tradition to the shape of my regalia and material. Although by doing so I wouldn't want to offend anyone if there is a rule about this... Would something similar to this shape of an apron be out of the question? Possibly use applique or ribbons to make similar designs of my own clan? Regalia is personal and the shapes and designs are up to the person wearing it - so long as you don't copy designs that don't belong to you or your tribe or family and so long as you don't look like some hokey wannabe. My grass outfits have aprons that come to an inward point on the bottom /\ shaped. I've seen some that have multiple points, some that are rounded, and some that are straight cut. I think your design would be neat looking and fairly unique and certainly noticeable. Materials can be anything. Most people just go to the fabric store and get whatever sturdy material fits their design. I use non-stretching cotton based fabric and I've seen others use satins and other materials. For fringe you can use ribbon or yarn. I don't use a cape and I don't think many people use them as much anymore. My ribbon is part of my shirt and I also have ribbon around my aprons and pants as well. I have fringed the leather on my cuffs, which is the only fringe that isn't ribbon. 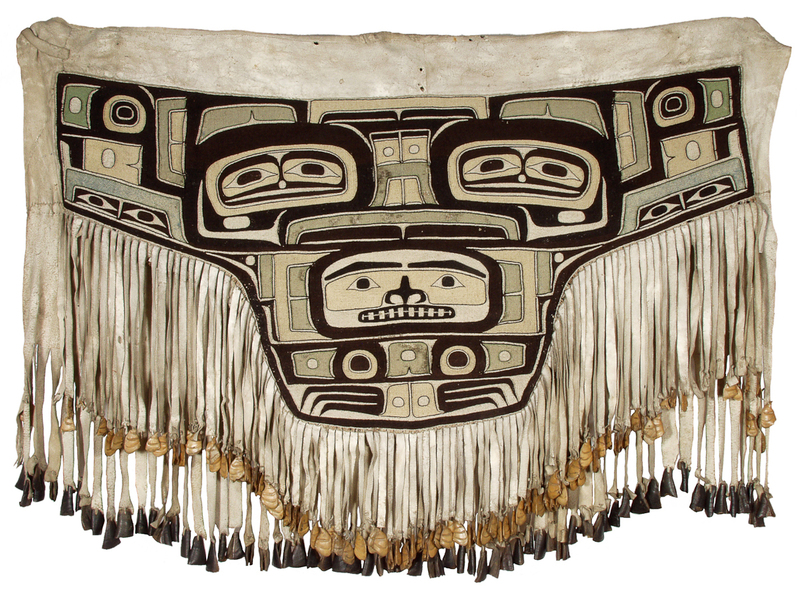 There are many threads on here about making grass dance outfits in our Grass Dance forums: Grass Dancing - PowWows.com Forums - Native American Culture Look at threads started or posted in by a user "sookout sh'nob"
Very cool, thanks for he help. I am thinking of using a felt material like we use for our regalia. Also, what do hokey wannabe's look like? I know this may sound like a silly question. When you say hokey wannabe, do you mean generic? I mean like people that copy the Hollywood style - think boy scout version. Generic would be a good term as well. They are people that buy premade Chinese beadwork from sites like Crazy Crow. Outfits are a labor of love and to be frank - they are expensive and time consuming to make. windanncer and Yeiltleix like this. I see what you are saying, yes, I definitely do not want to make my regalia Hollywood. Yeah, regalia is a labor of love for sure. My designs will be my clan and clan house emblem's. Including some of my great, great aunt's beading patterns I think.